Researchers have demonstrated prototype windows that switch from reflective to clear with the simple addition of a liquid. The new switchable windows are easy to manufacture and could one day keep parked cars cool in the sun or make office buildings more energy efficient. The technology can also be used to make roof panels that keep houses cool in the summer and warm in the winter. Although glass that uses an applied voltage to switch from clear to an opaque or tinted state is commercially available, its high cost— around $100 per square foot—has hindered widespread use. "We expect our smart glass to cost one tenth of what current smart glass costs because our version can be manufactured with the same methods used to make many plastic parts and does not require complicated electro-optic technology for switching," said Keith Goossen, who led the research team with Daniel Wolf of the University of Delaware. The new smart windows contain a plastic panel with a pattern of structures that is retroreflective. This means that rather than reflecting light in all directions like a mirror, it reflects light back in the direction it came from like a bicycle reflector. In The Optical Society (OSA) journal Optics Express, the researchers demonstrate a prototype of the new smart glass consisting of a 3D printed plastic panel covered by a thin chamber. When the chamber is filled with the fluid methyl salicylate—which matches the optical properties of the plastic—the retroreflective structures become transparent. "Although we had to develop new ways to process 3D printable plastics with good optical performance, develop inexpensive refractive index-matching fluids and come up with highly reflective optical structures, the innovation here is mostly in recognizing that such a simple concept could work," said Goossen. One of the most promising applications for the new switchable glass may be in cars, where it could be used to change the windshield to a reflective state when the car is parked in the hot sun. "You can't use today's commercially available switchable glass for this application because in the darkened state the windshield still absorbs sunlight and becomes hot," said Goossen. "Because our glass is retroreflective in the non-transparent state, almost all the light is reflected, keeping the glass, and thus the car, from getting hot." The fact that the glass is retroreflective means that if it were used on the outside of skyscraper, for example, it would direct light up toward the sun rather than down to the street. This reduces the building's contribution to city warming, which is a problem in many urban areas. 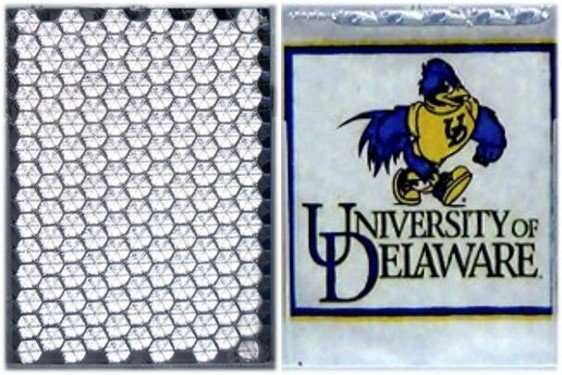 The researchers have also shown that the plastic retroreflective panels can be used as an inexpensive switchable roofing structure that cuts down on heating and cooling costs. In places that are warm and sunny year-round, white roofing materials have been shown to lower cooling costs by reflecting sunlight. However, in areas with cold winters, these white roofs prohibitively add to heating costs in the winter. "Here in Delaware, you would like to have a white roof in the summer to keep the house cool and a dark roof in the winter to absorb sunlight and help lower heating costs," said Goossen. "For smart roofing, our new technology offers a more effective type of cool roof because it is retroreflective while also allowing the roof to switch to dark in the winter." For roofing applications, a layer of material placed under the panels is used to absorb light when the panels are in their clear state. This helps keep the house warmer when outside temperatures are cold. Although the methyl salicylate used in the prototype could freeze in very cold climates (less than 16 degrees Fahrenheit), freeze-resistant fluids could be developed. To make the new switchable glass, the researchers started by using 3D printing to make plastic panels with repeating retroreflective structures of various sizes for testing. They used a commercially available clear 3D printable material and developed post-processing steps to ensure the plastic remained highly transparent after printing and exhibited very accurate corners, which were important to achieve retroreflection. "Without 3D printing, we would have had to use a molding technology, which requires building a different mold for every different structure," said Goossen. "With 3D printing, we could easily make whatever structure we wanted and then run experiments to see how it performed. For commercial production, we can use standard injection molding to inexpensively make the retroreflective panels." Once the researchers figured out the optimal size to use for the repeating structures, they performed optical testing to determine whether characteristics such as surface roughness or the material's light absorption would cause unexpected optical problems. These optical tests showed that the structures worked exactly as indicated by optical simulations. 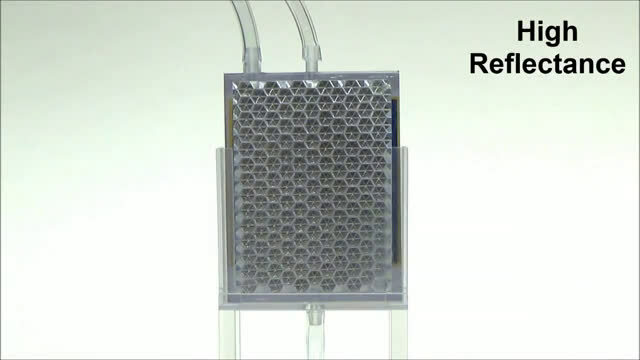 "Importantly, we also demonstrated that the device can undergo thousands of cycles from transparent to reflective without any degradation," said Goossen. They did, however, find that some fluid stays on the structure instead of draining off. To solve this issue, the researchers are developing coatings that will help the fluid drain off the plastic without leaving any residue. "To further demonstrate the technology's usefulness as switchable glass, we are building an office door that incorporates the new smart glass as a switchable privacy panel," said Goossen. "These types of panels are currently made with much more expensive technology. We hope that our approach can broaden this and other applications of smart glass." Cool, but maybe too cool? What about the insulating properties?